After many hours of trials and failures, research and testing this version of Stutter Remover is optimized and works with Windows 10 perfectly. No crashing when loading or exit and increases FPS significantly. Please enjoy this as much as I have. 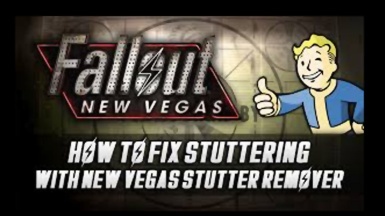 WORKING 100% Everyone with New Vegas in 2018 should download this and use it! This is a must have for anyone playing this game in 2018. Although Ideal for Windows 10, I have reports this fix also works well with WIndows7. 3. These files including the DLLs go into "data/nvse/plugins" if "plugins folder does not exist -- create"
4. Then download my ini file and overwrite the file in "data/nvse/plugins"
5. Then launch using NVSE Launcher (nvse_loader.exe) in your root folder and you are off! Version 2 has bHookCriticalSections enabled along with bReplaceRandom and a few other adjustments per the recommendations of others. I did not notice any performance increase nor stability however this is supposed to reduce micro stuttering.